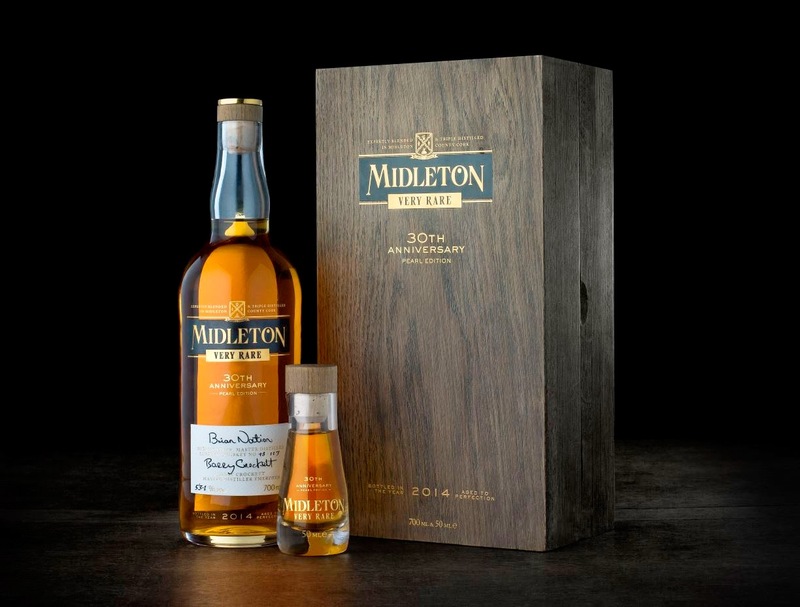 For three decades now, Midleton Very Rare has marked the passage of time with an annual vintage release. To celebrate the 30th anniversary of the first bottling in 1984, Irish Distillers has produced a very, very rare Midleton Very Rare Pearl Edition. It's a collaboration between Master Distillers present and former, Brian Nation and Barry Crockett, the bottle carrying the signatures of both. Back in 1984, the new Midleton distillery had been producing for just nine years, so the first Midleton VR was relatively young (the latest edition, in contrast, contains components between 15 and 22 years old). The concept for Pearl, according to Barry, was to ask how that first edition might have developed had it continued to age for 30 years. Evaporation loss over three decades, along with bottling at the cask strength of 53.1%, meant that there was only enough liquid to fill 117 bottles. Introducing the new whiskey at the launch dinner, Barry Crockett likened Midleton Very Rare to a symphony, each vintage being a variation on a theme, with Pearl the closing movement. Let's riff on Barry's musical metaphor for a while, and see where it takes us. 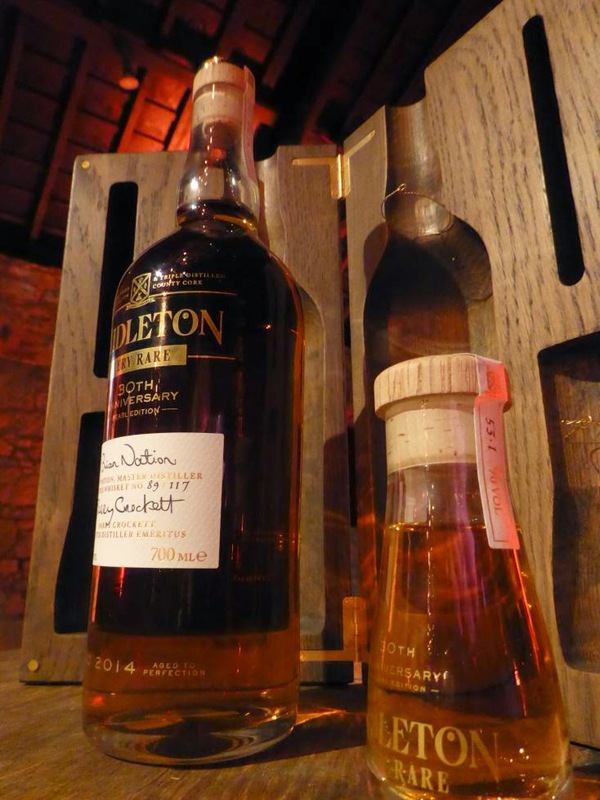 Your regular Midleton Very Rare is a set of gentle variations on a theme of vanilla and toasted oak (contributed by the exclusive use of ex-bourbon casks, mostly first- and second-fill). It's technically accomplished, with all the notes in the right place, but also unassuming, not intruding on the foreground of your attention unless you invite it to. It's a Haydn symphony, such as Lyric FM might stick on outside of rush hour when listeners are less distracted. Is Midleton Pearl another movement in the same symphony? I'm not even sure it's the same composer. Those extra years in cask have seen out the Classical era and ushered in that of the Romantics. We have added another 30 instruments to the orchestra, doubled down on the strings and filled out the bass staves with room-trembling low notes. We're enveloped in a lushly arranged melody, with emotion and memory prodded by a colourful, dynamic soundscape. The antique character is prominent, but don't think of the mustiness we associate with old pot still whiskeys from silent distilleries. Midleton Pearl is rich and vibrant on the nose and palate. After a long finish, right at the end, the vanilla and toasted oak theme returns as the music fades away. You may have guessed that I like this whiskey but you might also fairly suspect me of succumbing to the ambience of the launch event. 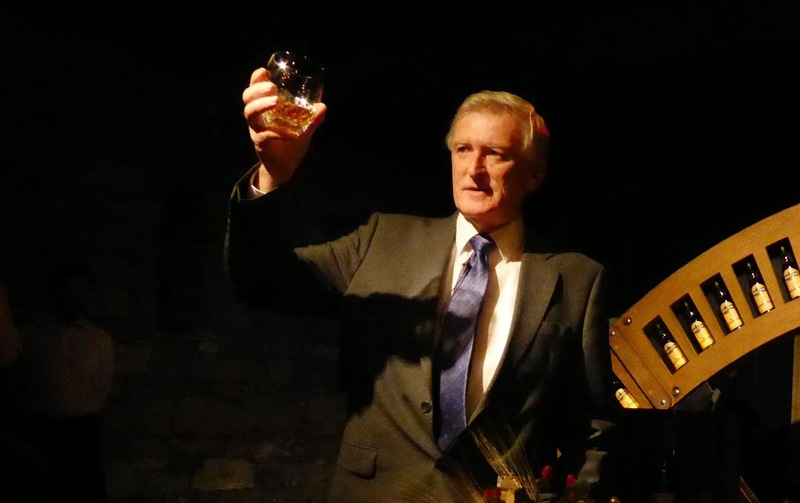 The whiskey was served in a Waterford Crystal tumbler, after a candlelit dinner prepared by Ballymaloe chefs, in Warehouse No. 8 of the Old Midleton Distillery, in the company of the various Masters. If there is any environment that would predispose one to rave about a whiskey, this is it. I still claim, however, that it is the finest Irish whiskey I've ever tried. I can't afford the price tag of €6,000 for a bottle but if there had been an option to trade €300 for a second glass, I'd have taken it. If you do have the means, the 117 bottles (well, 116 now) have been allocated for sale in Ireland, the UK, France, Germany and China (I was amazed to discover that 20 bottles are destined for China). The oak cases were crafted in County Wexford, from wood supplied by the Shanes Castle Estate in County Antrim. I occasionally taste a whiskey from a long-vanished distillery. It's a bittersweet experience, knowing I can never revisit it, mixed with some guilt for assisting in its extinction. It's likely I won't renew my acquaintance with Pearl either but I'm optimistic that a whiskey just as good, or better, will eventually come my way. There was a massive clear out of casks in Midleton in the 1980s and early 1990s to allow a fresh start under a stricter wood management policy. As a consequence there is very little in the warehouse that stretches back 30 years. But the pipeline is filling up again. There have been a succession of whiskeys from Midleton in recent years that have excited me: Redbreast 15yo, Powers John's Lane 12yo, Yellow Spot 12yo, Redbreast 21yo. On the evidence of Pearl, Midleton distillery is just getting warmed up. Not only does its spirit continue to improve as it ages, the recent expansion means it now has the production headroom to relieve pressure on ageing stock. The handful of distillate styles that Midleton was producing in the 1980s has been augmented since then, and the extra capacity will allow a lot more experimentation in that regard. So I'm not going to think of Midleton Pearl as the final movement of a symphony. Instead I regard it as an overture, a taster of extraordinary delights to come. The initial fresh herbal notes of crushed garden mint and rosemary, are a testament to the quality of the ex-bourbon barrels in which this whiskey has rested for many years. Soft honey sweetness along with beeswax shows its antique character, while hints of gingerbread combine with toasted oak to compliment some pot still spices. The soft silky mouth coating is initially honey sweet, then the fresh herbal flavours follow through with a touch of menthol. 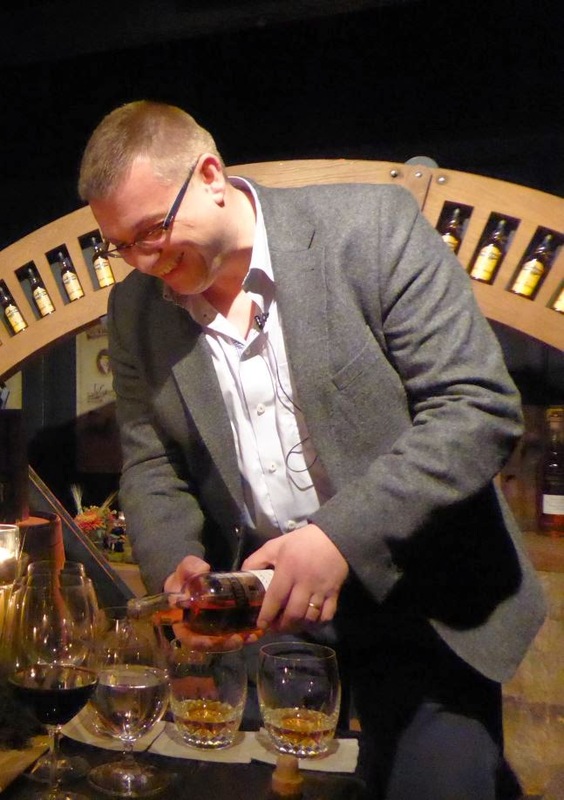 The spicy notes concentrate, staying sweet with cinnamon and liquorice before the toasted oak adds to the complexity. The succulence of the herbs and spices is very slow to fade.